With its day-to-day operations run by joint managing directors and founders Mark Vennis and Gary Phillips, Moviehouse Entertainment is one of very few truly independent film sales and production companies operating in London. The company is now in its 17th year and has a library of over 60 films. Mark, a 20+ year veteran of the film industry is an MA graduate of film studies and responsible for in-house productions as well as bringing new films in to the company, dealing with producers and financiers in addition to overseeing the company’s finances and associated activities. Prior to forming Moviehouse Entertainment, Mark worked in various capacities at Virgin Vision, J&M Entertainment and whilst at the latter, initiated and ran their Alternative Cinema Co. label. In addition, for three years, he was a Director of Mansfield Associates, working directly in the financing sector of the UK Film Industry. Gary, similarly with 25+ years in the independent film sales arena, guides all the company’s sales, marketing and associated activities. These include attendance at all the major film markets in Berlin (the European Film Market), Cannes (Film Market) and Los Angeles (the American Film Market) as well as festivals where the company’s films play. These have included attendance at Sundance, Berlin, Locarno, Toronto and Edinburgh. Prior to forming Moviehouse Entertainment with Mark, Gary held a variety of senior sales-related positions at J&M Entertainment, Majestic Films & TV and prior to that in the Television Distribution business with The Samuel Goldwyn Company and Warner Bros International TV. Between them they have executive produced nearly 30 films including Nicolas Winding Refn’s first English Language movie Fear X which premiered at the Sundance Film Festival, The Rage in Placid Lake, an Australian comedy starring Rose Byrne, Blind Flight, the true story of the kidnapping of Brian Keenan and John McCarthy with Ian Hart and Linus Roache, Sandy Collora’s cult sci-fi hit Hunter Prey, the acclaimed South African gangster movie Jerusalema and most recently the hit UK movie Nativity 2 with David Tennant in the lead role. They have also worked with John Boorman (the Tiger’s Tail) Nick Broomfield (Biggie and Tupac), Lenny Abramson (Adam and Paul), John Battsek (Live Forever) and Stephen Kijak (Scott Walker 30 Century Man), amongst others. Their first in-house production, Funny Cow, was theatrically released in the UK April 2018 by Entertainment One and received critical acclaim garnering 4 and 5 star reviews in The Guardian, Independent and Times amongst others. Funny Cow World Premiered at the 2017 London Film Festival along with their second, Here To Be Heard: The Story of the Slits, a documentary about the first all-girl punk band. 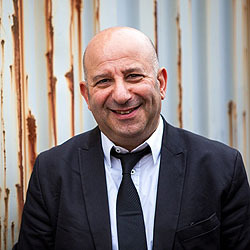 Mark has served as a director for Film Export UK, the Sales Agent’s industry body, for two years and as a mentor for the Screen Yorkshire Triangle program for two years in 2013 and 2014. Gary is on the steering committee of the London Screenings and regularly does film industry advocacy work. They both are BAFTA voting members.